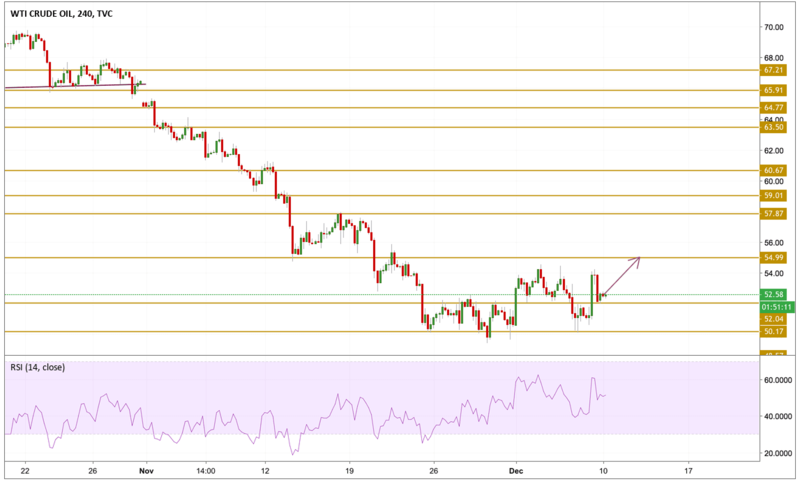 Crude oil prices are seeing limited gains in early Monday action, extending last Friday's gains following the OPEC+ announcement that the oil cartel would begin cutting production in 2019. On Friday, it was announced that OPEC and non-affiliated countries would be cutting crude production by 1.2 million barrels beginning in January. WTI peaked at $54.10 on the news before falling back again with the US crude industry opting to not take part in the cuts. Oil prices are still trading in the same range after failing again to break to the upside above the $55 level. The price is currently hovering just above the $52.5 level with relatively positive momentum. If prices manage to hold above the $52 support level, then a correction upwards would be most likely to happen with the $54.99 resistance level in focus.